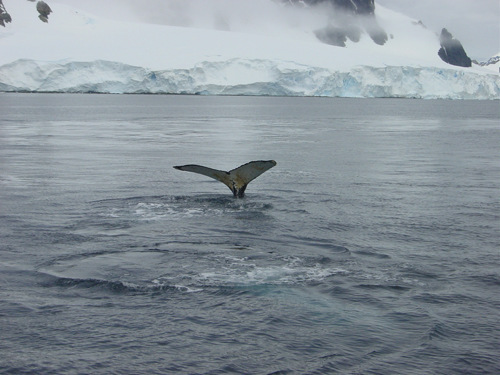 Depending on conditions, we will begin by exploring the northern areas of the Antarctic Peninsula, then journey to select locations where you can best experience the vast grandeur and incredible wildlife of the region; including whales, penguins, birds and seals. Then we head further south (continuing as long as ice conditions allow) into areas rarely visited by man. Your antartic expedition is accompanied by a tour guide who knows everything about this surreal world. He/she will give lectures about the fauna and flora and guides the passengers on their excursions. On Bark Europa we know from years of experience that three weeks is the minimum amount of time for your Antarctic adventure, in order for you to visit and enjoy those quiet and untouched places accessible only to vessels like Bark Europa, and to become truly immersed in this rare and marvellous place. The wild life that is normally experienced starts from your arrival here in Tierra Del Fuego. Through the Beagle Channel, the Drakes Passage and Antarctica there is an amazing amount of unique wild life that you will see. Birds: Those of the South American continent, sea birds of the Drake and those special ones of Antarctica. Penguines: Live in the waters of Tierra del Fuego, Magellenic, but the really large colonies are when we are in Antarctica itself, Gentoos, Chin strap and Adelie. 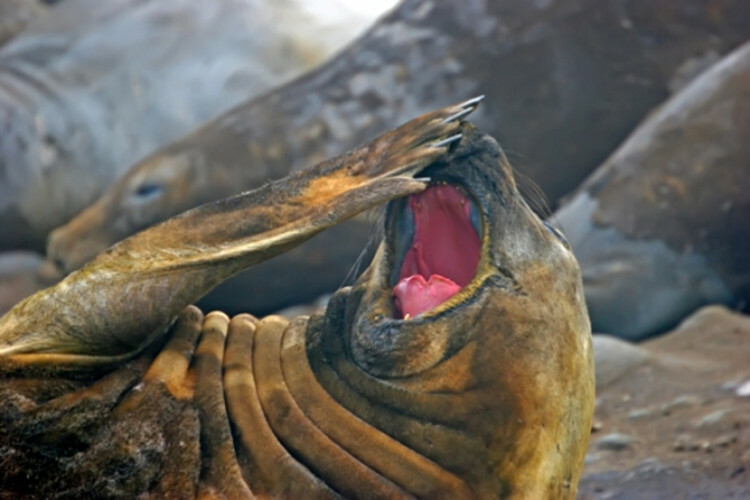 Seals: There are 2 types of seals which you will experience, those of the “Eared” species, which are sea lions and fur seals, and those of the true seal family which are the Weddle seals, Crab eaters and the infamous Leopard seal. Whales: These can even be seen at times during summer in the Beagle Channel and around the Cape Horn area, however the larger number of whales are far more often seen when we are there in Antarctic waters, either on the edge of the peninsular or within the straights and bays around the Antarctic continent. Types: Humpbacks, Sei, Fin, Killer whales and very rare the Blue whales. When whales are either curious or feeding we can spend hours following and watching their behaviour. Landing in Ushuaia you will see the fascinating beauty of the region with its many glaciers. 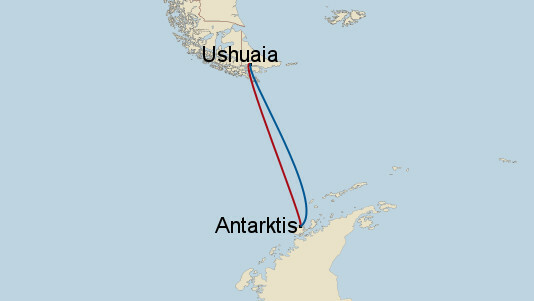 It is highly recommended to arrive in Ushuaia a day before the embarkation. 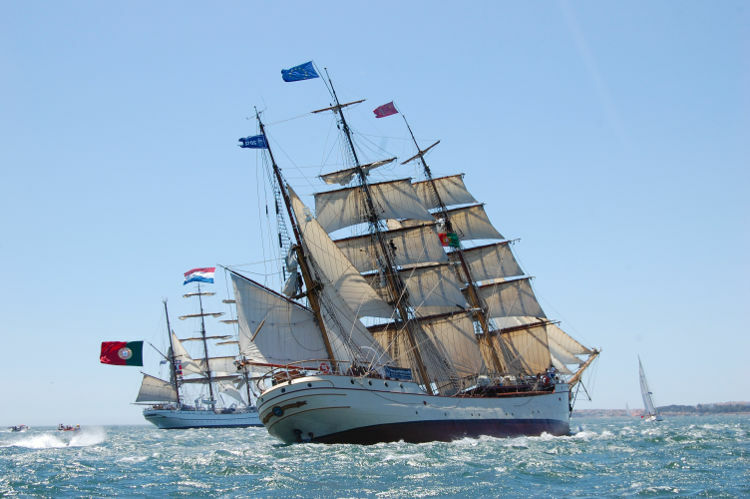 The crew welcomes you on the Bark Europa at five p.m. You find the ship at the pier "Puerto Comercial". 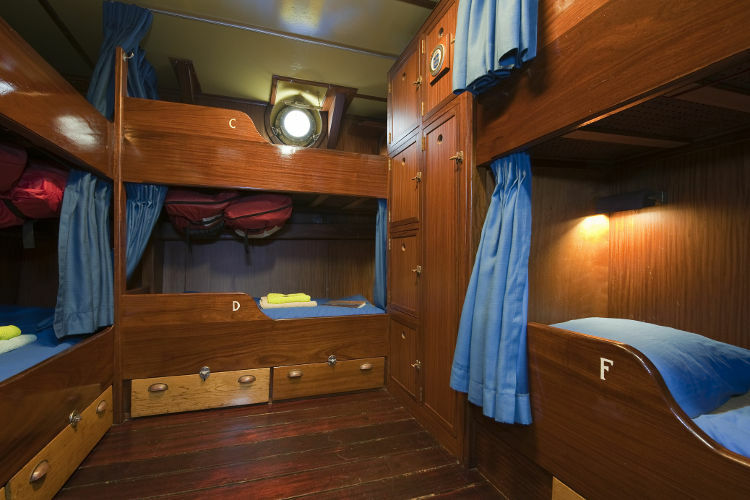 After moving into your cabin, you and the other passengers will enjoy your first meal on board. Then the captain will inform you about the sailing plan. After a calm night in the harbour the ship heads on in the Beagle Channel. On board the passengers get their first safety instructions. 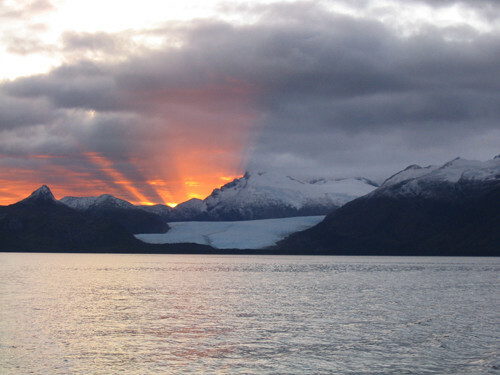 In the evening you can marvel at the impressive landscape of Tierra del Fuego. Today you sail through the Drake Passage, passing Bahia Nassau and the famous Cape Horn. 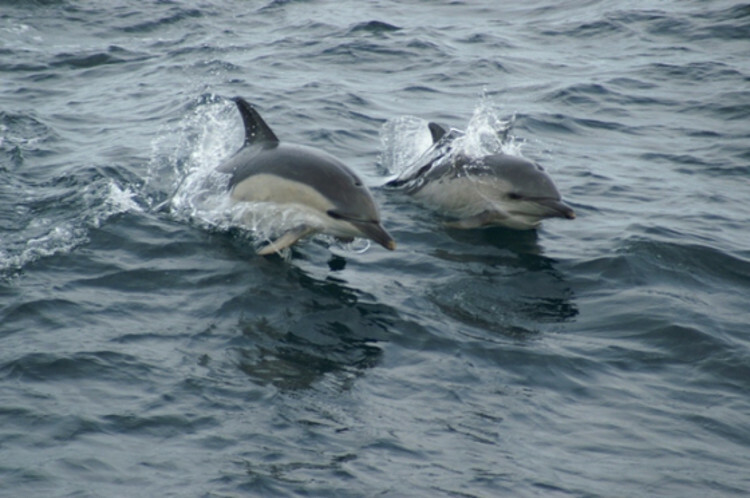 While sailing through the Drake Passage your participation is assumed. At the stormy Cape you will be accompanied by Cape petrels, White-chinned petrels and Albatrosses.After passing the Antarctic Convergence Zone the water temperatur falls from 5° to 1° Celsius. The water becomes green and species-rich. Today starts your first excursion. The Bark Europa anchors at the Barrientos Island, an Island of the Aitcho Archipelago. The ship is surrounded by penguins and at the beach you can observe gentoo and chinstrap penguins. Further more you can spot elephant seals and giant petrels. With a little bit of luck you will be able to spot a humpback whale today. If there is enough time, the bark Europa will be sailing to the famous Edinburgh Hill. This basalt rock was created by a volcanic eruption and sticks out in the middle of the sea. Depending on the weather and the surrounding conditions you visit either Yankee Harbour or Hannah Point. Yankee Harbour is a safe harbor on Greenwich Island. In the past, it was a very popular spot for seal hunters who made it a basecamp during their hunting parties. 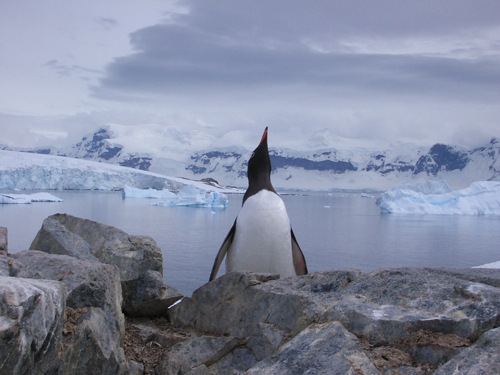 In addition, the area is well known for its colony of Gentoo penguins consisting of approximately 4.000 breeding pairs. Hannah Point is located on the southern shore of Livingston Island. Its gravel beaches and sandy slopes are the habitat for a lot of different plants and wildlife that can be observed, for example elephant seals, nesting penguins, king cormorants, giant petrels and whales. Further to the south there is ring the ring-shaped Deception Island. Your ship sails through the narrow passage by the name “Neptune’s Bellows” right into the island’s impressive crater. At Pendulum Cave, a former bay used by whalers, you can experience the unique features of the island during an excursion or, in case of good weather, have a bath in one of the warm springs at the beach. In former times, there was a whaling station on the island. Later this protected bay made a base camp for explorers, but was destroyed by volcanic activities in 1970. Furthermore it is possible to visit the biggest colony of chinstrap penguins of the antarctic peninsula at Bailey’s Head. Today you will cast the anchor between Spert Island and Trinity Island. 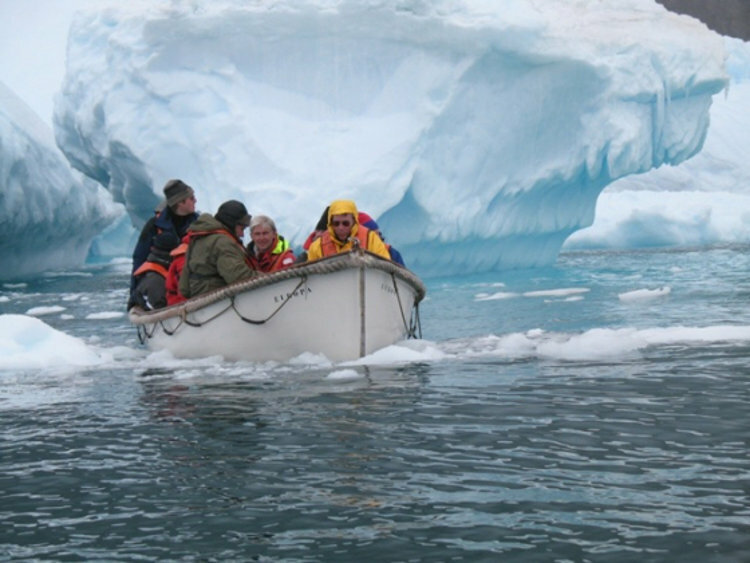 By dinghy you explore the impressive and amazing icescape and enjoy the play of colours and the turquoise water that make the world seem somehow surreal. At Enterprise Island you might be lucky to spot some whales or you can visit Governoren Harbour. This town was named after the whaler who went by the same name and who was shipwrecked here. Today the wreck of his ship serves as a nesting site for seabirds. 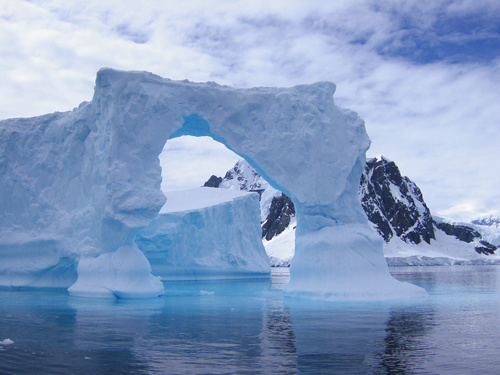 Alternatively you sail on up to Cuverville Island, which is characterized by its glaciers and steep cliffs. It is populated by a variety of seafowl. The island as well gives a splendid view on the Errera Channel and the Gerlache Strait. On the 11th day of your trip you experience the impressing force of the ice. You will be surrounded by glaciers and ice walls towering out of the water. 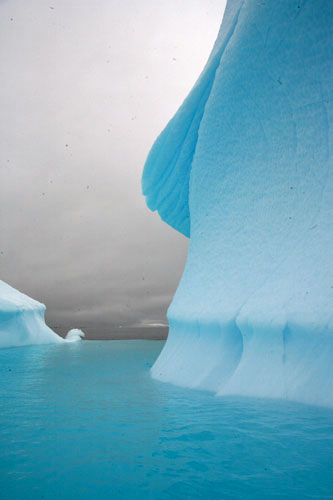 You will hear the crackling and tearing of the ice and see icy rocks collapsing into the water. Today you will pass the Lemaire Channel, also called the Kodak Gap, where you will be surrounded by cliffs up to 1.000m high. 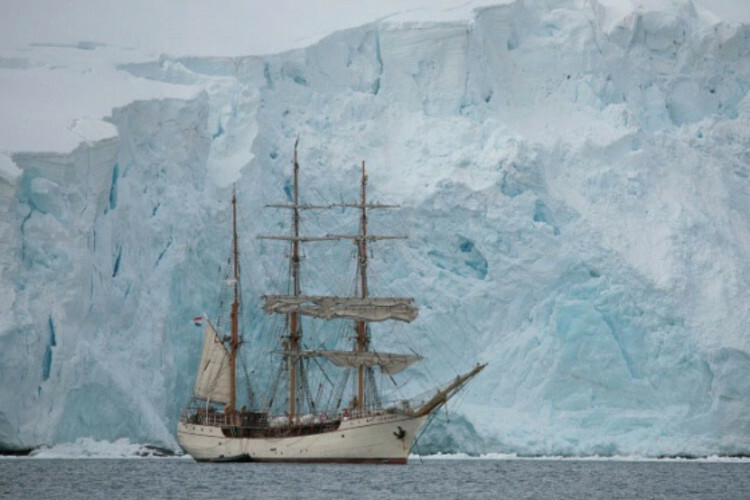 The ship will be sailing through the narrow Penola Strait and, depending on the condition of the ice, come to pass Penola to reach the Archipelago in the early evening. Your captain will navigate the vessel through a maze made of ice and islands to a fitting anchorage. In the afternoon you will visit the Ukrainian research station Wernadsky, which is populated by 10-15 people and receives supplies only twice a year. A research assistant will guide the passengers through the station, that is provided with an own pub and a sauna, and will report of the scientific work and everyday life at this station. Some hours after leaving the Argentine Islands you will reach Petermann Island, where you will be able to observe breeding Adélie penguins for the first time. You will cast the anchor at one of the most beautiful spots of Antarctica with an awesome view on the Fife mountain chain. There you will visit Port Lockroy, a natural port of the British Antarctic Territory, where you find both a museum and the only Antarctic post office. 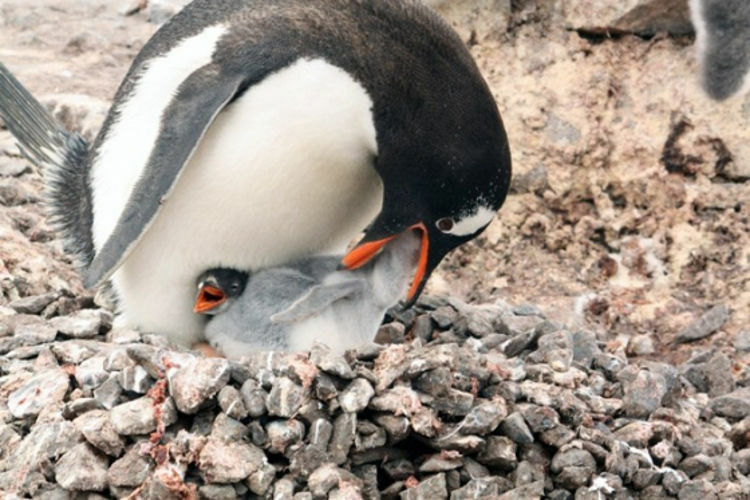 The island serves as a nesting site for Gentoo penguins, who often build their nests right on the walkways or on the door mat of the post office. At Jougla Point you are able to visit a completely reproduced skeleton of a whale. Near Port Lockroy lies Dorian Bay. The plateau glacier in between those paces was used as an airfield for small planes in the past. In Dorian Bay a walk makes you experience the unique view, in addition you can find both gentoo penguins and Weddell seals. In the afternoon the bark will set sails through the Schollaert Channel to reach the Melchior Islands. You may be lucky to see Orcas with their pups during that trip. Today holds the last of your zodiac trips, that lets you discover the environment of the Melchior Islands with your dinghy. About noon you will begin your journey home, where you will pass Anvers Island and Mount Francais while headed towards South America. During the next days the bark travels through the Drake Passage again. On its way, it is accompanied by seafowl and dolphins. While crossing the Drake Passage, the ship passes Diego Ramirez Island and sails towards Cape Horn. On its way to the Beagle Channel you can admire the impressing break waving at the rocks of Cape Horn. Both the Islands and the fjords you see are becoming greener and greener again. While travelling the last miles of the Beagle Channel, it’s your last opportunity to breathe some fresh sea air. Right before arriving in Ushuaia the ship passes the “Islas de Lobos”. With a binocular you can observe a variety of seafowl. Within sight of Ushaia, it is time to finally time to pack your kitbag again. 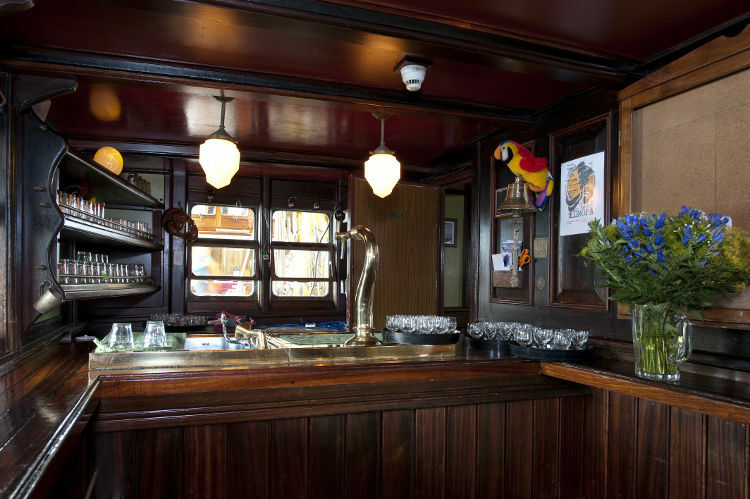 On the 22nd day you and your fellow sailors enjoy the last breakfast on board of the bark Europa. You will say goodbye to the ship, its crew and the other travelers and start your journey home.